Who in their right mind would want to be colorblind? Just ask 29 year-old Granger Smith, singer/songwriter, who thinks it would greatly help his memory problems. “Colorblind,” currently climbing the Texas Music Charts in the top 20 singles, is the latest hit from his 2006 Livin’ Like a Lonestar album that he recorded and engineered in his own home studio. The smooth, intoxicating melody of “Colorblind” whisks you away into Smith’s memory which holds green eyes, blonde hair, the color of her lips, and his desire to be colorblind. 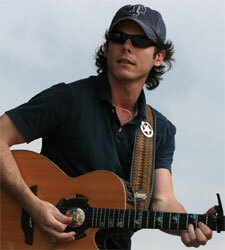 Drawing from musical influences like George Strait, Smith describes his style as traditional country, sans rock. 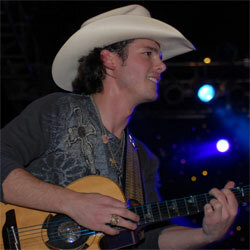 He first got his big break at age 20 when he had the opportunity to work in Nashville with EMI Publishing. He left school in the beginning of his junior year at Texas A&M University and moved to Nashville, where he was met by a slew of veteran writers who had hit songs before he was even born. Smith would throw out some lyrics and they would fire back with questions that would challenge him to really think about the meaning behind his lyrics. “In Nashville it was great to see how the studio works, how the musician works with the producer, and how things flow. Even though I typically don’t co-write as much anymore, I can still hear the questions they would ask me,” Smith said. Four years later, Smith had a new publishing company and manager who allowed him to make the trek back to College Station, Texas where he finished school. Things really began to take off for Smith while he was going to class and playing small gigs on Thursday nights. Before too long – guitar and diploma in hand – he was traveling on the weekends with a loaded schedule, playing to packed houses. And it’s still obvious that playing live is his favorite part of the gig. Even if the road leads all the way to Iraq. For two years running, the Granger Smith Band has traveled to Iraq to play for the troops. It was so important to him that Smith poured his time into contacting Aggies that he knew in Iraq until finally an overseas booking agency made the dream a reality. Smith says that bringing a piece of home to the men and women in Iraq and helping to boost their morale is what he is most proud of as an artist. So what’s next for Granger Smith? Smith is currently working on his fifth full-length album and hopes to have it finished by the end of the year. Once again, he’s recording and engineering it right out of his home studio with his own band. Whatever the future may hold, Smith maintains a positive outlook on his career. Check out grangersmith.com for more information about Granger Smith, including tour dates, and how to get your hands on his music.